Recorded in several spellings including Haugh, Haughs, Hauman, Heugh, Heughs, Howe and others, this is a locational and sometimes job descriptive, surname of ancient and complex origins. It derives from the pre 7th century old English word 'healgh' meaning an enclosure or small type of fort. There were hundreds of these semi-defended places in the medieval times, and a number survived to become villages and towns in their own right. A 'healgh' could be any shape, but was often a circular mound, protected on the outside by a ditch or moat, and planted on top with belts of thorn bushes and trees. This helped to keep raiders out, cattle and sheep in, and provide protection for the small cottages inside. The north side of the important Hartlepool harbour in the county of Durham, is known as Heugh, and provided defense. Other examples include the village of Heugh, in Aberdeenshire, Scotland whilst 700 miles away at the other end of the British Isles, Heugh Town, now generally spelt Hugh Town, is the capital of the Scilly Isles, in the English Channel. The earliest recording is probably that of Willam de Ho of the county of Essex, in 1148, Alan Hagheman, in the Hundred Rolls of the county of Hampshire, England in 1275, and in Scotland, John de Heughe. 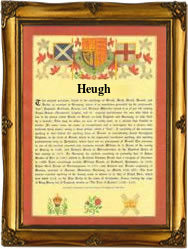 He is recorded as being the notary public for the city of Glasgow, in 1409.